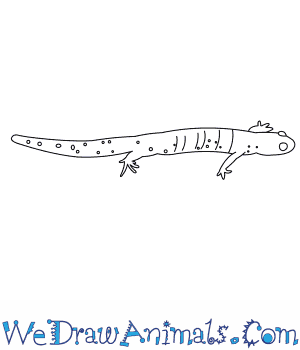 In this quick tutorial you'll learn how to draw a Blue Spotted Salamander in 7 easy steps - great for kids and novice artists. At the bottom you can read some interesting facts about the Blue Spotted Salamander. 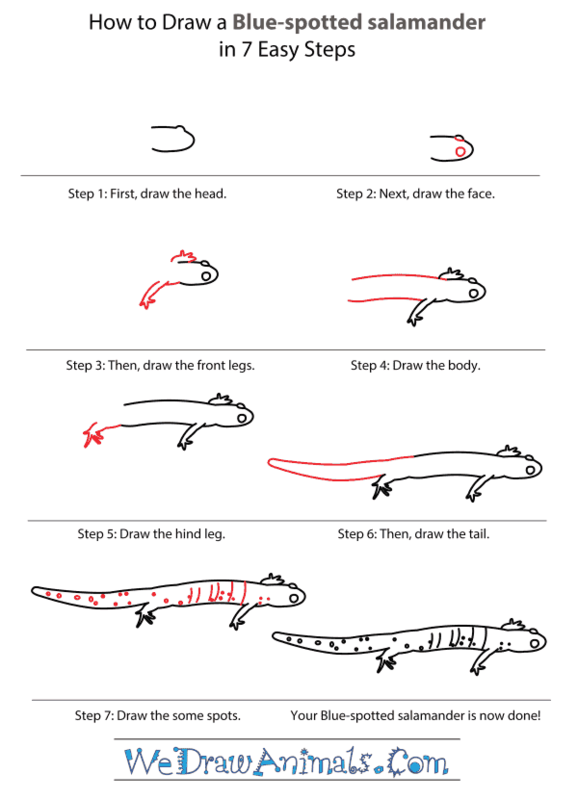 Step 1: First, draw the salamander's egg-shaped head. There should be a small arch for where the far eye would be. Step 2: Next, where your arch is make a line. 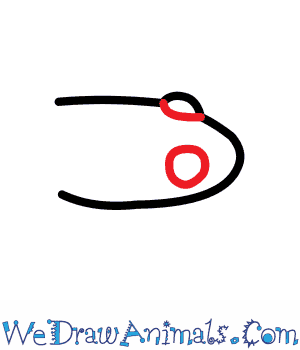 Draw a circle on the opposite side of the far eye. Step 3: Then, draw the front legs. 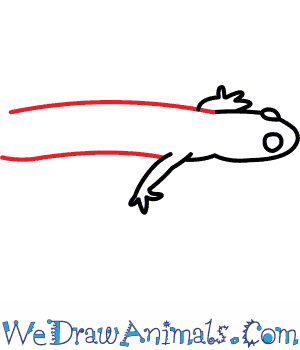 Make a short line that comes from the bottom of the head for the chest of your salamander. 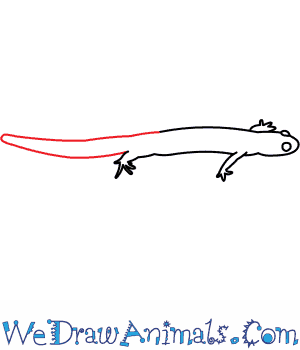 From there, connect two lines that end in three points for the salamander's toes. 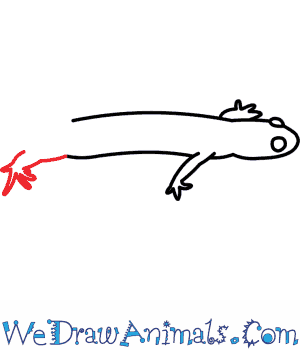 Attach the far leg to the upper side of your salamander. 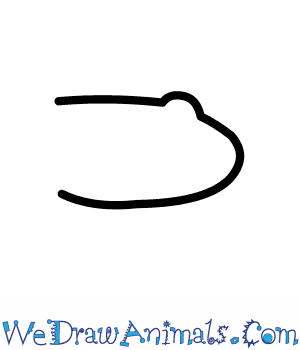 Step 4: Draw the body using two long lines. Step 5: Draw the hind leg slightly shorter than the front leg using the same shapes you did for the first leg. 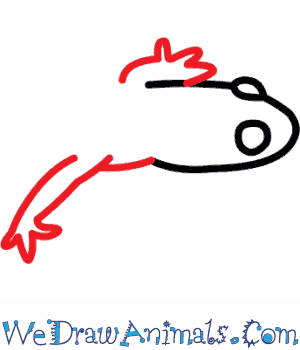 Step 6: Then, draw the tail connecting the side closest to you to the foot and the far side to the top body line you made previously. 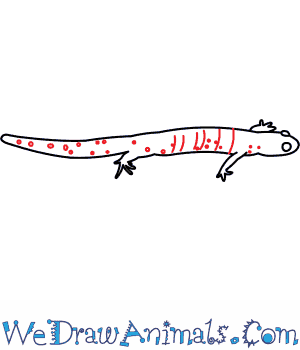 Step 7: Now for the most important part of your blue spotted salamander; the spots! In addition to the spots, make several lines to create the texture and movement of the body. The blue-spotted salamander (Ambystoma laterale) is found in North America. Unlike most salamanders, they do not stay out in the sun; they prefer moist forests and stay out of the sunlight, and look for food at night. The blue-spotted salamander grows up to five inches long, and its tail is 40% of its body length. It gets its name from the blue and white speckles on his back, over bluish back skin. They have four long toes on their front feet and five on their back feet. Females usually lay about a dozen eggs at one time, on plants or rocks near a pond or ditch. They can lay up to 500 eggs a year. Newly hatched salamanders are born with developed eyes, mouth, gills and tail fins. It takes about two weeks for them to develop their font legs, and then another week to grow their back legs. Over time, they lose their gills and leave the water, developing into an adult salamander. Lesson plan note: Discuss the changes of the blue-spotted salamander between hatching and becoming an adult, how it is similar or different to animals than develop in an egg or womb, and why salamanders might change so much after birth.